On-loan defender David Atkinson has signed for Blyth Spartans permanently – subject to final confirmation – after leaving parent club Carlisle United by mutual consent. The 23-year-old originally arrived at Croft Park in December and had only had his loan spell extended earlier this month, but he will now remain at the club indefinitely after Alun Armstrong was able to agree a deal with the former Middlesbrough youngster. Atkinson, who made 37 appearances for Carlisle during his two-year stay with the League Two side, is expected to finalise paperwork in time to be available for Saturday’s trip to Mickleover Sports. 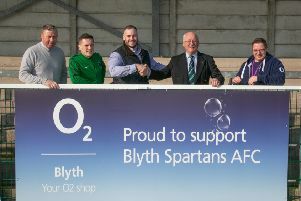 And the right-back’s addition to the Spartans quad has delighted Blyth boss Armstrong. Hesaid: “David is a proper defender, so I’m chuffed to have him join the club permanently. It’s a great signing for us. “His first couple of games here were just to get him bedded in, but now he’s really starting to step it up a gear and show exactly what he’s capable of. Despite agreeing to leave a Football League club in order to join the Evo-Stik Premier League leaders, the 41-year-old has backed Atkinson to give himself every opportunity of making his way back up the leagues. Armstrong added: “He wants to play at a higher level, but doesn’t everyone?